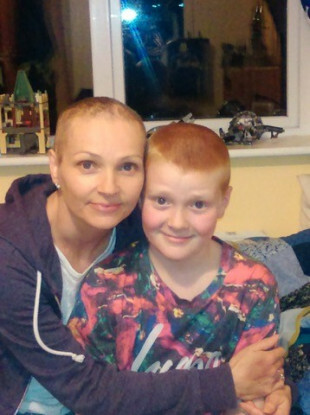 Mother-of-three Ger felt a lump that turned out to be breast cancer. With her family’s support, she managed to come out the other side. GER FELT FINE. She didn’t feel sick and felt no symptoms at all when she first felt a lump. The mother-of-three told TheJournal.ie that straight away she knew “it wasn’t normal”. She was referred for a mammogram by her GP and, a month later, she was diagnosed with breast cancer. Originally from Carlow, but now living in Donabate in north Dublin, Ger said her friends and family rallied around her following the diagnosis. “The funny thing is you end up counselling other people,” she said. “People don’t always know how to deal with it. The hardest was telling my parents… And even telling the children I was optimistic with them. It was important, she said, to reassure the children in particular that their mother was going to get the right treatment and would be fine. “Children know so much these days,” Ger said. When you have three boys who need their mammy, you’ll do anything. From the beginning, we called it a ‘good cancer’. Ger underwent surgery for a mastectomy, and then received 16 chemotherapy sessions before an extensive radiotherapy programme. One of the side effects of her treatment was losing her hair. This family took on this issue the same way it had done with the original news, according to Ger. “I didn’t want everyone to be up in their bedroom crying,” she said. “I wanted everyone to be positive. Ger was effusive in her praise for her friends in the local area who she said were such a great help when she was going through her treatment. Furthermore, she said that the staff at St James’s, Beaumont and the Bon Secours Hospital were fantastic over the course of her treatment. Even after she got the all clear for her breast cancer, it wasn’t all plain sailing. Last autumn, she was diagnosed as having a rare form of skin cancer. Luckily, she had that tumour removed last September. “Hearing that I had cancer again wasn’t easy,” she said. “But I got through that. After all that, you don’t sweat the small stuff. Everyday you wake up is a good day. When I was going to the treatment, I’d think every night I was so glad it was me. Thank god it was me and not them. As part of its latest campaign this October, the Irish Cancer Society is asking members of the public to hold a Cups Against Cancer coffee morning. The money raised will fund breast cancer research and the free services to support breast cancer patients and their families. Ger said that she would regularly ring the society’s helpline during the course of her treatment, to seek advice on various things. After her treatment concluded, she helped to organise a charity fundraiser that raised over €6,000 for the Irish Charity Society. “I’d encourage all women to regularly check their breasts,” she said. “I tell friends that even if they’re going into the doctor for a sore throat, get them checked out. “We are so lucky to be this generation of women. Previous ones didn’t know to check. We are aware that treatments are so doable now. I was only 43 when I was diagnosed, and I was one of the oldest women there getting chemotherapy in the Bons. It’s not an old woman disease. We need to make sure and check regularly and think ‘wait, was that there two weeks ago’ if we feel a lump. More than anything else, Ger said that it was a positive attitude that helped sustain her and support her family throughout her battle with breast cancer. She closed our chat with this anecdote, from when she and several other women were going for radiotherapy. “It’s a real Irish thing, but laughter really is the best medicine. I remember in Beaumont, cancer patients would get free parking. But you’d have to go up to the guard there and let him know that’s what you were there for. He says to me, ‘are your Murphy?’. I said ‘no, I’m Collins’. He just looked at me and said ‘you all look the same with that crew cut’. You have to laugh. You really do. For more information on how to get involved in the Cups Against Cancer initiative, visit www.cancer.ie/cupsagainstcancer. To speak to a Cancer Nurse on any aspect of breast cancer contact the Cancer Nurseline on Freephone 1800 200 700, email cancernurseline@irishcancer.ie or drop into one of 13 Daffodil Centres in hospitals nationwide. For information on Daffodil Centre locations and opening times email daffodilcentreinfo@irishcancer.ie. Email “'Every night I was so glad it was me. Thank god it was me and not them'”. Feedback on “'Every night I was so glad it was me. Thank god it was me and not them'”.